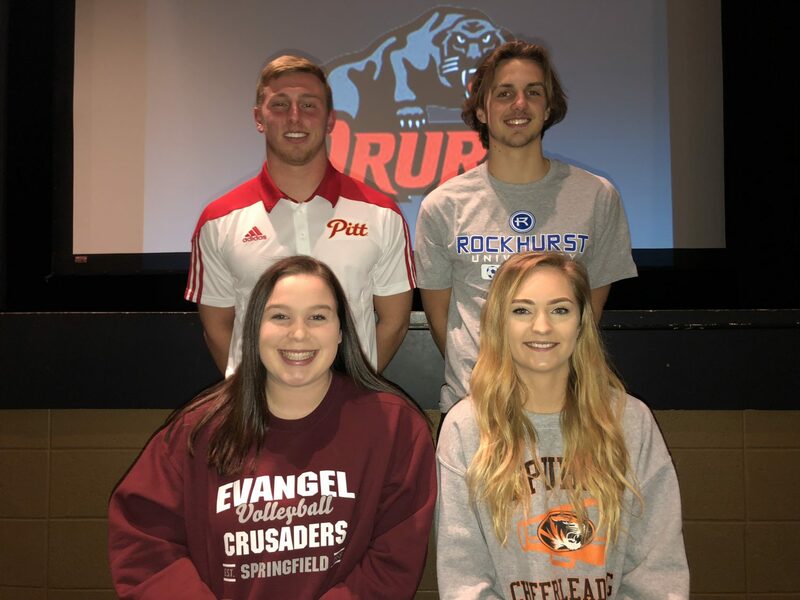 Four Republic athletes — from football, soccer, volleyball, and cheer — have signed letters of intent to compete in college. Riley Watkins will play football at Pittsburg State University. Eryn Russell will attend Evangel and play volleyball. Dylan Brown will be a member of the Rockhurst College soccer team. Caitlyn Sturgis will be part of the competitive cheer squad at Drury. For Riley Watkins, the road to Pittsburg State began several years ago. Republic football coach Dustin Baldwin only had one season with Watkins as his quarterback, but saw enough to know what Pittsburg State is getting in Watkins as a player and a student. Eryn Russell has been a big part of the varsity volleyball team at Republic for three seasons. Now she’ll have even more time on the court, as she makes the move to Evangel. “I’ve always wanted to play college volleyball. I love the sport, so I don’t want to give up after high school,” Russell says. Evangel coach Mary Whitehead is happy—and a little bit surprised—to have Russell join the team next year, after seeing her play up close a few weeks ago. Russell will join former Republic teammate Hailey Noblitt at Evangel next fall. Dylan Brown re-wrote the soccer record books at Republic in only three seasons. Now he starts over again at Rockhurst College in Kansas City, a place with a much longer and more storied soccer history. Head coach Tony Tocco will be in his 47th year at the helm of the Hawklets next season, and Rockhurst was ranked third in the last national poll. For Brown, the choice was easier because not only did Rockhurst make a better scholarship offer, they are also one of the best soccer programs around. Brown says he’s looking forward to playing in a place where the soccer game atmosphere is similar to a Friday night football game in southwest Missouri. “It’s very wild. Their stands are right next to the out-of-bounds line. They’re all about soccer,” Brown says. Tigers coach Kevin Hauck says Brown has changed soccer in Republic, and will take that play-making ability to the next level. “Dylan has made a huge impact on our program since being here. He’s helped raise the program to a whole new level. 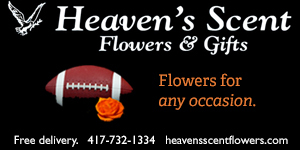 He’s someone who can change the game at any given time,” Hauck says. Republic cheerleader Caitlyn Sturgis has always had a passion for competitive cheer, even before she joined the high school squad a couple of years ago. Now she takes that passion to college, and one of the best competitive cheer squads in the nation at Drury University. Republic coach Matthew Massey is excited to see Sturgis compete on the national stage with Drury, whose cheer squad finished second at nationals last year. Sturgis says competing at the next level will give her the opportunity to do things she hasn’t been able to do up to now.